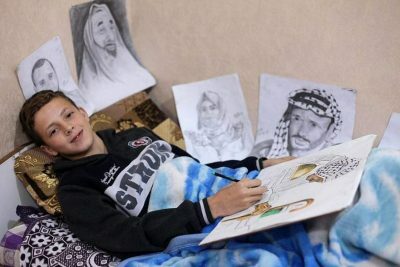 Majd al-Madhoun, a young, 13-year old Palestinian artist, was shot for the second time by an Israeli soldier while protesting peacefully in the Great March of Return protest near the fence which separates Gaza from Israel. Majd’s first shot was in his leg. The second was a rubber bullet in his head. Majd has been hospitalized, but that didn’t stop him from doing what he loves to do the most. I go to every the protests every Friday and Monday and participate with my family and friends, calling for our basic right to live a decent life,” Majd added. Majd is well-known among his colleagues and relatives for his inspiring art. He has participated in several local exhibitions inside the Gaza Strip. “My wish is travel across the world and participate in international exhibitions,” he said. The young artist painted a picture of Razan Al-Najjar, the iconic Palestinian medic shot dead by Israeli gunfire while treating the injured in the Great Return March. He also painted several pictures of Palestinian leaders and martyrs. His grandfather discovered his talent when he was only five years old. “Living under occupation and siege, imposed since I was born, inspired me and affected my paintings,” Majd said. Since March 30, Palestinians have protested peacefully, every Friday, at the separation fence east and north of the Gaza Strip to break the blockade Israel has imposed on Gaza since 2006, and call for their right to return to their occupied homeland. The also protest the naval blockade by demonstrating near the maritime fence every Monday. According to Ministry of Health spokesperson Dr. Ashraf al-Qedra, around 219 Palestinians have been killed and over 20,000 injured with live ammunition. Majd is not the only child shot during the Great Return March. Many others had their legs amputated. 12-year-old Abdur Rahman Nofal is an example. He lost his leg when an Israeli sniper shot him with a live bullet. It’s been nine months, and Palestinians insist on continuing their peaceful marches until the Israeli blockade is lifted and the people of Gaza can live like the rest of the world. Wafa Aludaini, a Gaza-based activist and journalist, is the manager of the 16th October Group.